(Nanowerk News) Eric Furst, associate professor in the Department of Chemical Engineering at the University of Delaware, has received two grants totaling $727,000 for his work on directed self-assembly of soft materials. The National Science Foundation (NSF) has awarded Furst $292,000 to investigate interactions and self-assembly of anisotropic colloidal particles in electric fields, while the Department of Energy (DOE) has granted him $435,000 to study directed self-assembly of nanodispersions. Soft materials, which are neither crystalline solids nor simple liquids but lie somewhere in between, include soaps, paints, gels, plastics, glues, and biological tissues. 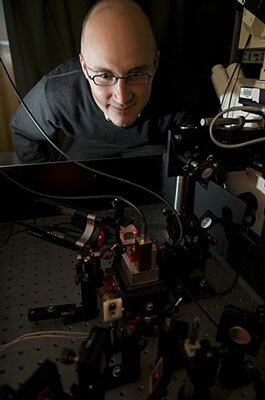 According to Furst, directed self-assembly is especially important for the development of nanotechnology, and his two recent grants are an outgrowth of previous funding to a group of faculty in the UD Department of Chemical Engineering through NSF's Nanotechnology and Interdisciplinary Research Team (NIRT) program. “Engineering micro- to nanoscale devices and nanostructured materials requires control and understanding of the thermodynamics and kinetics of self-assembly of nanoscale building blocks in solution,” he says. One approach to providing that control is to use electric fields to guide the process in a particular way. The new NSF grant will support work addressing that issue, with a particular focus on unusual particles known as doublets, which resemble two spheres pushed together. The DOE project will be directed toward how the technology can be used to harvest soft materials for energy applications.